The Freeling family (JoBeth Williams, Craig T. Nelson, Heather O'Rourke) settles into a new home following the annihilation of their former residence by terrifying visitors from the netherworld. But the spirits of the dead are still hell-bent on luring the family's clairvoyant daughter Carol Anne to "the other side"! Technical Specs: BD-50 Blu-ray Disc,NEW 2K scan of the interpositive,NEW slipcover (guaranteed for three months after its original release date),The newly-commissioned front-facing artwork from artist Justin Osbourn (Lifeforce, The Fog, Child's Play). The reverse side of the wraps will showcase the original theatrical poster art. Some sequels expertly build upon their predecessors, evolving characters and plotlines in new and exciting ways while giving audiences a brand new experience that still manages to respect what made the original effort so compelling in the first place. Some sequels are truly worthy follow-ups that stand tall all on their own. Some sequels even surpass their older siblings, weaving a rich new story full of surprises. 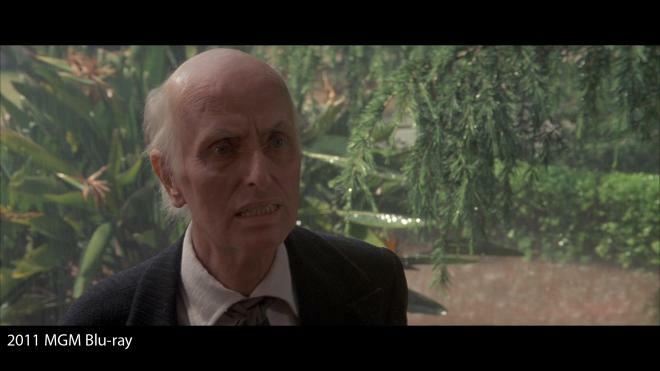 Some sequels are damn fine films, and then some sequels… are 'Poltergeist II.' A mostly harmless, but overwhelmingly mediocre retread of the original, the movie does little to expand upon the fun thrills of its precursor. Instead, it just slumps haphazardly along with only a few minor bursts of excitement. "They're back," but I'm not sure I care. A bit of time has passed since the Freeling family's first, near fatal supernatural house call, and the gang seems to be adjusting to a ghost-free existence just fine. Unfortunately, little Carol Anne (Heather O'Rourke) starts to exhibit clairvoyant abilities, and it seems the netherworld isn't quite ready to give her up just yet. After a visit from a creepy old preacher, Kane (Julian Beck), history starts to repeat itself, and the Freeling's new home gets some uninvited, ethereal guests. 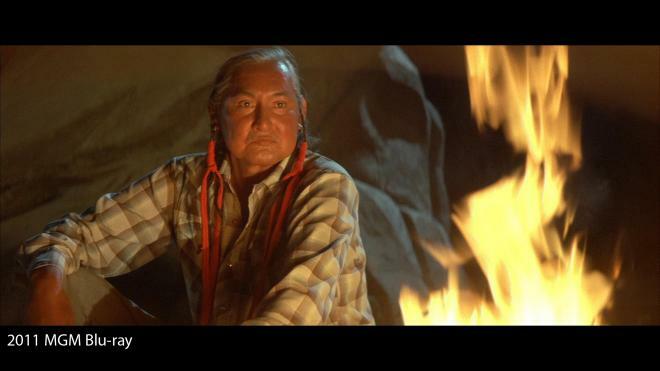 Thankfully, Steve (Craig T. Nelson) and the rest of the family are provided with some much needed assistance in the form of a kindly Native American shaman (Will Sampson) and everybody's favorite, tiny little medium, Tangina Barrons (Zelda Rubinstein). Eventually, as the forces of darkness attempt to steal Carol Anne forever, the family must band together and, through love, overcome the threat of evil. Yeah, it's kind of sappy. The plot elaborates on the original's haunted cemetery storyline by throwing in a religious cult that was buried alive by its insane leader. While Beck is extremely effective as the evil zealot (he's probably the best part of the movie), the whole narrative is fairly thin and unengaging. We get some back-story on the evil spirit and his unfortunate flock, but it's quite convoluted, underdeveloped, and disconnected. The script continues to mix Speilberg-esque family dynamics with haunted house hijinks, but it all feels rather tired and dull. There are some sporadic moments of excitement, though, including a particularly fun sequence involving a really bad reaction to Tequila, but for the most part, the scary set pieces are few and far between. In fact, I was a bit surprised by the lack of actual thrills here, and when they do come, they're pretty fleeting and ho-hum. Killer braces and possessed chainsaws are all well and good, but these scenes lack substantial tension and creativity, and the running time is padded with far too many forgettable conversations and saccharine observations. Going along with the lackluster set-up, the climax is also disappointing, featuring some lame effects and a rather cheap resolution. The heartfelt message is sweet, but it all comes across as very schmaltzy and a bit silly. Ultimately, there just isn't much substance here, and by the end, despite the supernatural events and dimension crossing shenanigans, it doesn’t really feel like anything all that significant has happened. The conclusion simply lacks oomph. Still, the movie certainly does offer marginal entertainment, it's just generic, bland, and thin. 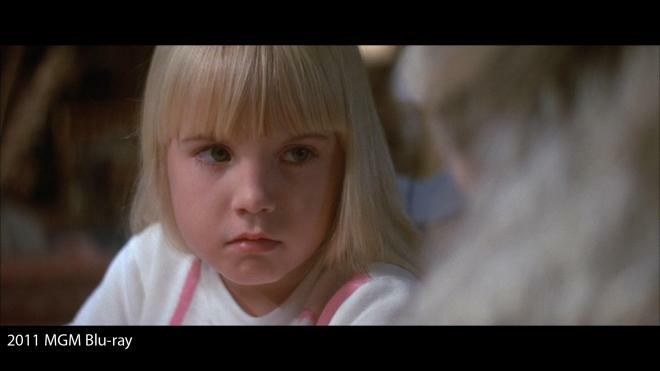 'Poltergeist II' isn't a horrible flick, but it completely fails to forge its own identity. Uninspired and light on scares, this follow-up falls short, and though it repeats the major beats of its predecessor, it doesn't bring anything fresh to the table. The cast does an admirable job with what they have to work with, but the few new characters and plotlines are poorly conceived and add very little to the proceedings. It's just an unnecessary sequel. Shout! Factory presents 'Poltergeist II' on a BD-50 Blu-ray disc that comes housed in a keepcase with a cardboard slipcover and reversible artwork (the original theatrical poster art is on the other side). After some logos and warnings, the disc transitions straight to a standard menu. The packaging indicates that the release is region A coded. BD-50 Blu-ray Disc,NEW 2K scan of the interpositive,NEW slipcover (guaranteed for three months after its original release date),The newly-commissioned front-facing artwork from artist Justin Osbourn (Lifeforce, The Fog, Child's Play). The reverse side of the wraps will showcase the original theatrical poster art. The movie is provided with a 1080p/AVC MPEG-4 transfer in the 2.35:1 aspect ratio. Culled from a new 2K scan of the interpositive, the video offers a welcomed improvement over the previous MGM release. Outside of a few negligible specks, the source print is in great shape. A light layer of grain is visible throughout and is more finely resolved and consistent than the previous Blu-ray. Likewise, clarity is slightly improved as well, rendering more pronounced fine textures and depth. In addition, the new transfer features different color timing than the MGM disc, resulting in a cooler cast compared to the warmer, rosier complexion found before. This is particularly evident in the film's climax when the family enters the "other side" (see above screenshots). Though I can't say for certain which color grading is more accurate, the blue tint here does match the archive clips of the finale found in the included vintage special features -- which leads me to believe that this disc offers the correct presentation. Contrast seems to be honed in a bit more here as well, leading to dimmer yet more natural brightness and deeper blacks in some shots. Finally, the framing is also opened up just a tad, offering a little more picture on all four sides of the image. Marked by improved detail and seemingly more faithful color timing, this Collector's Edition release of 'Poltergeist II' comes to Blu-ray with a solid video upgrade. Filled with some lively but sporadic set pieces, the track offers a few fun moments of auditory thrills. Dialogue is clear, but there are some very minor crackles in the high frequencies. Directionality is decent with a fairly wide soundscape for effects and score. While the mix can be a little front heavy, things get aggressive during the major set pieces, and surround use is solid, bolstering the score and carrying various ghostly sounds and displaced voices around the room. Like many horror films, there are a few moments that start off quiet and then climax in a burst of noise and music, and the track's dynamic range handles these sequences well. Though not quite as thumping as one might expect, bass activity does help to add some excitement to the mix. The various audio elements are all evenly balanced, placing due emphasis on dialogue, effects, and music when appropriate. In addition, the 2.0 mix presents a great audio experience as well, providing strong left and right stereo separation and solid fidelity (though minus the added immersion of the surround channels, of course). Shout! Factory has provided a nice collection of supplements, including two commentators and several retrospective and vintage featurettes focused on the special effects. All of the extras are presented in 1080p or 1080i with DTS-HD MA 2.0 sound. Audio Commentary with Writer/Producer Michael Grais – Grais sits down for a Q&A style commentary session with an interviewer. The discussion covers the writer's background in the industry and work on the first film, along with details on the sequel's story development, casting, director, original ending, and reshoots. Likewise, Grais shares a few worthwhile anecdotes and memories about working with the cast and crew. There are a few gaps in the conversation here and there, but fans should enjoy the listen. Audio Commentary with Poltergeist II Webmaster David Furtney – This track features the webmaster of the 'Poltergeist' fan website. Furtney provides a wealth of information about changes made from the script to screen, extra story details, production trivia, and a scene-by-scene account of how the film's original cut was reconfigured for the final version. This isn't the most lively listen, but there's plenty of worthwhile info here. Robbie's Return (HD, 14 min) – This is an interview with actor Oliver Robins (Robbie). Robins reminisces about his experience shooting the film as a kid, what it was like working with the director and cast, and shooting the special effects scenes. The Spirit World (HD, 22 min) – Here we get an interview with special effects designers Richard Edlund, Steve Johnson, and Screaming Mad George. The participants discuss working form H.R. Giger's designs and how they accomplished certain shots, rounding out an interesting breakdown of the movie's very solid practical effects. Ghosts of Giger (HD, 21 min) – Here the focus is on artist H.R. Giger's contributions the film along with an interview with his friend and agent Les Barany. They’re Back: The Making of Poltergeist II (HD, 6 min) – This is a vintage behind-the-scenes piece with cast & crew interviews and on set footage, mostly focusing on the effects and designs. Monster Shop (HD, 3 min) – Another vintage featurette is included, once again offering a bit more on the creatures and effects. Ghost Makers (HD, 6 min) – Here we get yet another vintage piece focused on the effects with cast and crew interviews and behind-the-scenes footage. Several bits are repeated from previous extras, but there's still some worthwhile material. Theatrical Trailer (HD, 1 min) – The movie's original trailer is included. TV Spots (HD, 2 min) – Four vintage TV spots are included in upscaled 1080i. Stills Gallery (HD, 6 min) – An extensive collection of production stills and posters is included. Poltergeist II Script (HD, 10 min) – The movie's shooting script is presented as a gallery of script pages. 'Poltergeist II: The Other Side' is a mediocre sequel that fails to match the first film's thrills and entertainment value. It's not horrible, but its lack of originality and excitement make its existence hard to justify. Thankfully, this Collector's Edition from Scream Factory offers a nice upgrade over the previous MGM release, providing an improved transfer, the addition of a 2.0 audio mix, and a nice assortment of supplements. The movie itself is still pretty lacking, but for fans of the flick, this is an easily recommended and a very worthwhile double dip.